Satirical Merchant token of England. It satirizes the French Revolution. Copper halfpenny token engraved by William Mainwaring, 1794. There are several varieties (9?). Look carefully to see the tracks leading from the foot and around the inner field; this represents the masses of the peasants meandering around destructive and changing dynamic of the French Revolution. The word "throne" has been diminished and set on its head. The word RE\LI/GI\ON has been chopped up just as the revolution had desecrated the Catholic church and had killed more than 1000 clergyman. "FRA-NCE" has been divided "HONOR" and "GLORY" has been trod upon and kicked. The 'map' is surrounded by daggers with 'FIRE" rampant in every corner of France. By 1794 the chaos and murder associated with the French Revolution had revealed itself fully with the killing of over 30,000 people, mostly royalty, rich landowners, counter revolutionaries, and clergy. The reverse sentiment "May Great Britain Ever Remain the Reverse" expresses the fear and concern that a similar revolution be avoided even in a country that needed reforms of it's own. The French Revolution was a much different revolution than the one in America. It lead directly to Napoleon Bonaparte and a return of the monarchy. My other 'Conders' are associated with Matthew Boulton and the Soho mint. This is included because of the fascinating theme and my interest in other tokens related to the French Revolution that were struck at Soho [Monneron]. 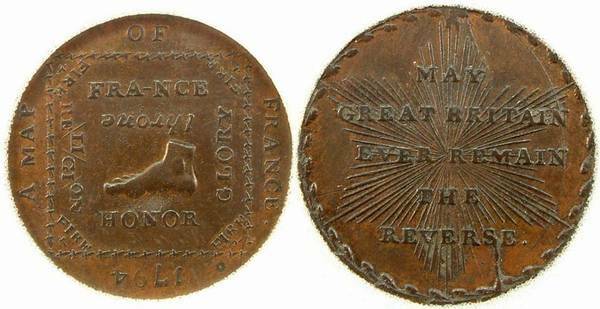 Peter Kempson, Copper Halfpenny, 1794, obv: A MAP OF FRANCE 1794, a foot within a square border, HONOR (trampled) underneath, FRA-NCE divided, THRONE (turned upside down), GLORY (defaced), RELIGION (broken up), FIRE (in every corner), daggers (murder) on every side, and bloodshed all over; rev: MAY GREAT BRITAIN EVER REMAIN THE REVERSE radiated within an oak wreath, large letters in inscription, G of GREAT and N of BRITAIN touch the wreath, edge PAYABLE AT THE WAREHOUSE OF THOMAS CLARKE (Atkins p.369, 98a; D&H Middlesex 1016a). Very Rare. This one has small reverse lettering because the G/N do not touch the wreath (D&H 1016 series). This piece perhaps makes the medium work too hard. Taking as the basic theme a conceptual map of France, the obverse depicts HONOR trodden underfoot, the THRONE overturned, GLORY obliterated with cross-hatching and RELIGION shattered into pieces, while FIRE burns at every corner and the whole design is surrounded with daggers and runs with wavy lines intended to represent flowing blood. The sententious legend of the other side, "May Great Britain ever remain the reverse", puns on the medium of issue in a different way. Although the allusions may seem over-clever to us, William Mainwaring had struck metaphorical gold with this design of his, which is known in twenty different issues and three different metals (though gold is not one of them). Its popularity can be explained by English horror at the new developments in France as the Revolution there reached its final and bloodiest stages. Rare to Very Rare.